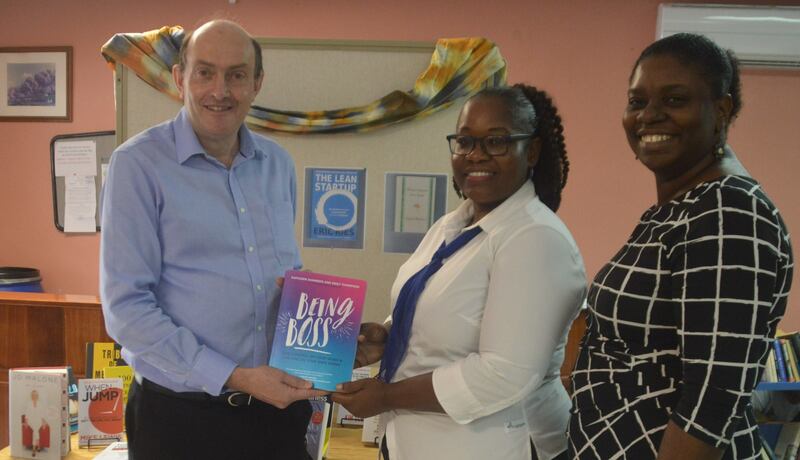 The Governor’s Office on Friday, donated a collection of business books on entrepreneurship to the Montserrat Public Library on Friday afternoon. His Excellency the Governor Andy Pearce handed over 23 books to the Minister of Education Delmaude Ryan in the presence of other officials and librarian Sonja Smith. Governor Pearce said the books contribution was inspired by last November’s Innovate to Lead (i2LPitch) competition which brought forth several great ideas from local entrepreneurs. The books were purchased through the Global British Fund and is part of several initiatives from the Governor’s Office to support young entrepreneurs on island. Minister of Education Delmaude Ryan, who is an avid reader, said she has several of the books in the collection and highly recommends them for anyone who is planning to start a business or currently owns one. Librarian Sonja Smith the books have already been catalogued and are available to borrow. She also encouraged residents to become members of the library to take advantage of all of their resources. The new collections includes books by Oprah, Tim Ferriss, Guy Kawasaki, Sheryl Sandberg and Levi Roots. The library is open Monday to Friday from 9AM to 4:30PM and on Saturdays 10:30 to 2PM.